On December 2, 2018, thousands of Georgians took over the streets in Tbilisi to protest against the election of the ruling party-backed candidate Salome Zurabishvili to the presidency, claiming fraud on November 28’s runoff vote. The defeated candidate Grigol Vashadze, the candidate of opposition groups led by the United National Movement (which was founded by former reformist President Mikheil Saakashvili and the leader of the 2003 "Rose Revolution"), said opposition parties would challenge the outcome in court. French-born Zurabishvili (a former French career diplomat), who had the backing of former Prime Minister Bidzina Ivanishvili’s ruling Georgian Dream party is set to become the country’s first female head of state, although the role is largely ceremonial. She won 59.5 percent of the vote in the runoff election, according to country's election authorities. Vashadze secured 40.5 percent. 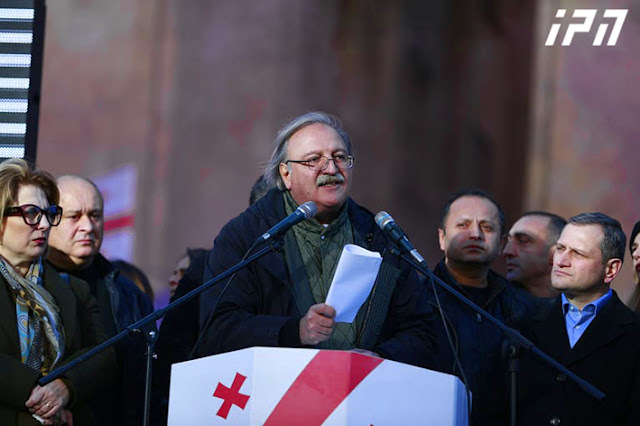 “We don’t recognize illegitimate results of this rigged election and demand an early parliamentary election to be called in the country,” Vashadze told thousands of supporters at Sunday’s rally in Tbilisi. Also, Mikheil Saakashvili addressed the huge crowd by video link from Amsterdam, where he lives in self-imposed exile. During the protest rally, the opposition led by Vashadze offered the government an "ultimatum": Either negotiate in "a different legal and political environment", or face series of continuous street protests. The ultimatum expires on December 16, the day Zurabishvili presidency is to be inaugurated. "Neither will we transcend the Constitution nor break the law, nor will we get into fist fights. We have enough education, intelligence, and experience that we can legally defeat you. The Georgian people will defeat you legally. Our anger will be expressed in continuous protest [rallies] until the voice of the Georgian people is heard," Vashadze, said in his address. Monitors from the Organisation for Security and Cooperation in Europe (OSCE) said the election was competitive but they also raised concerns about misuse of administrative resources that "blurred the line between party and state."